As the Metropolitan Museum of Art in New York opens its Punk: Chaos to Couture exhibition to the public, punk style is firmly back on the fashion agenda. Of all the A-list attendees walking the red carpet at Monday’s Costume Institute Gala at the Met, only a handful stuck to the punk-themed dress code (yes, we’re talking about you Miley Cyrus, Sienna Miller and Madonna) proving just how tricky this look is to interpret and, moreover, pull off (yes, Madonna, we’re talking about you again). But in anticipation of this year’s Met Ball and the accompanying show, the punk influence was seen all over the autumn/winter 2013 catwalks, meaning that it will be one of next season’s biggest trends. Versace was the most punk of them all, with models strutting down the runway with an added dose of attitude sporting latex rubber skinny trousers, shouty slogan tees and tartan kilts, all topped off with silver spiked chokers, cuffs and chains. Nods to punk were also spotted at Moschino (think heaps and heaps of tartan), Alberta Ferretti (more tartan, this time in dress form), Holly Fulton (PVC) and Saint Laurent, which, overall, was more grunge, but still had elements of punk with tartan shirts and slashed leather skinnies. But where can you shop to get the look? Well, first port of call is Moda Operandi, who sponsored this year’s Met Ball, which has released an exclusive collection of luxury punk-inspired pieces by the likes of Thom Browne, Balenciaga, Givenchy, Preen and, the queen of punk fashion herself, Vivienne Westwood (see below). But if you’re not blessed with a huge budget to spend, browse the rails at Topshop, Miss Sixty and All Saints, to name just a few, with lots more looks set to trickle down to the high street for next season. Or be truly punk and make up your own fashion rules! 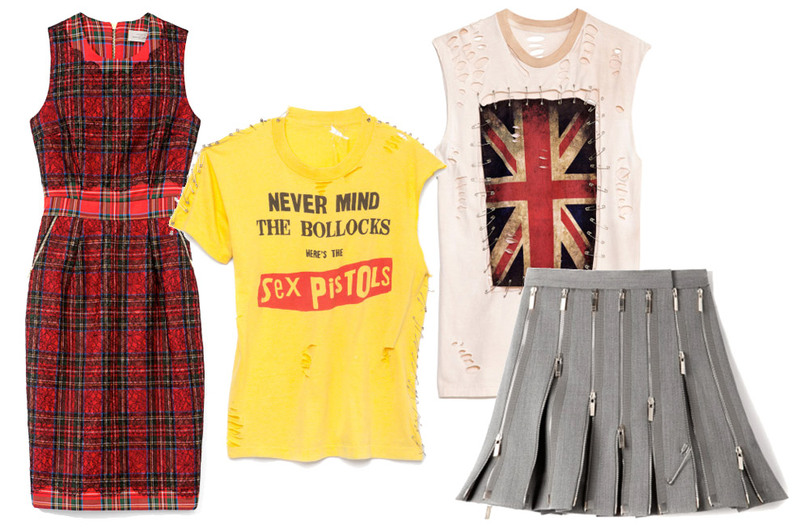 What do you think of the punk fashion trend? Will you be giving it a go?